Every company should have a Board Of Directors. At the start it can simply be a one person board consisting of the founder. But it should not stay that way for long. Because if you are your own board, you won’t get any of the benefits that come with having a board. These benefits include, but are not limited to, advice, counsel, relationships, experience, and accountability. The shareholders elect the Board of Directors. But there is usually a nominating entity that puts directors up for election by the shareholders. If the founder controls the company, then he/she is usually that nominating entity. I am a fan of a three person Board early on in a company’s life. I generally recommend that a founder put himself/herself on the board along with two other people they trust and respect. The election of directors in this scenario is simply a matter of the controlling shareholder voting them in. This situation changes a bit when investors get involved. If the founder retains control, then the situation does not have to change. The founder can still nominate and elect the directors they want on the board. However, investors can and will negotiate for a Board seat in some situations. This is less common for angel investors and more common for venture capital investors. The way investors negotiate for a board seat is usually via something called a Shareholders Agreement. This is an agreement between all the shareholders of the company. It contains a bunch of provisions, but one of the provisions can be an agreement that the shareholders of the company will vote for a representative of a certain investor in the election of the Board of Directors. The representative can even be named specifically. For many of the Boards I am on, this is how my seat is elected. For venture capital investments, this is a very typical provision. Adding an investor Director does not mean that the founder loses control of the Board. It can remain a three person Board with one investor director and two founder directors. 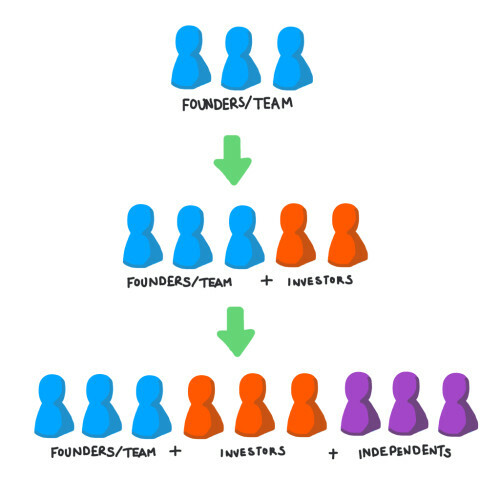 Or the Board can be expanded to five and the investors can take one or two seats and the founder can control the rest. These two situations are common scenarios when the founders control the company. As a company moves from founder control to investor control, the notion of an independent director crops up. And independent director is a director who does not represent either the founder or the investors. I am a big fan of independent directors and like to see them on the Boards I am on. Boards that are full of vested interests are not good boards. The more independent minded the Board becomes, the better it usually is. When the founder loses control of the company (usually by selling a majority of the stock to investors), it does not mean the investors should control the Board. In fact, I would argue that an investor controlled Board is the worst possible situation. Investors usually have a narrow set of interests that involve how much money they are going to make (or lose) on their investment. It is the rare investor who takes a broader and more holistic view of the company. So while investor directors are a neccessary evil in many companies, they should not dominate or control the board. The founder should control the board in a company he or she controls and independent directors should control a board where the founder does not control the company. When and if a company goes public, the Shareholders Agreement will terminate and public company governance standards will dictate how a board is selected and elected. There will most likely be a comittee of the Board that is called the Nominating Committee. That committee will select a slate of directors that will be put up for election by all the shareholders of the company at the annual meeting. Most public company Boards have staggered Board terms such that a subset of the Board is elected every year. Three year and four year terms are most common. It is possible for the shareholders to put up an alternative slate. In theory, this approach could be used in both private and public companies, but in reality it is almost entirely limited to public companies. This will be percieved as a hostile move by most companies and they will fight the alternative slate of directors. This “aternative slate” approach is most commonly taken by “activist investors” who take a meaningful minority stake in a public company and agitate for changes in the Baord, Management, and strategic direction of the company. But it can also be used in a hostile takeover effort. It is very very rare for an alternative slate to take control of a company, but it is fairly common for a new director or two to get elected in this way. Boards should evolve. Boards should recruit new members on a regular basis. Board members should have term limits. I like the four year term. But I’ve been on Boards for much longer. I’m in my thirteenth year on one board and my eleventh on another. These are not ideal situations but they involve companies I invested in while I was with my prior venture capital firm and I have a responsibility to my partners and the founders to see these situations through. A much better example is Twitter, where I was the first outside Director, taking a board seat when Twitter was formed in the spinout from Obvious and USV made its initial investment. Over time Twitter added several investor directors and then started adding independent directors. By last fall, Twitter had the opportunity to create a board with two founders, a CEO, three independent directors, and one investor director. As a shareholder, that sounded like the right mix to me and I voluntarily stepped down along with my friend Bijan who had led the second round of investment. The point of the Twitter story is that Boards evolve. In the first year it was me and two founders and a founding team member. In the second year it was me and Bijan, two founders and a founding team member. In the third year it was three investors, two founders, and two senior team members. In the fourth year, it was three investors, two founders, a CEO, and three independents. And now it is one investor, two founders, a CEO, and three independents. Many of these changes in the Twitter board happened at the time of financings. That is typical of a venture backed company. In summary, the shareholders elect the Board. That is the essential truth in every company. But how they elect the directors can be very different from company to company. For public companies, it is largely the same for all. In private companies, as JLM would say “you get what you negotiate for” so negotiate the Board provisions carefully. They are important. Most importantly, build a great board. They are not that common. But you owe it to your company to do that for it. Building a great board is tough but essential. First rule: don’t fill independent seats with people who have no operating or startup experience. When you have weak members, strong members tend to dominate, sometimes leading to a single board member pushing the CEO in a direction they favor. The worst thing you can do is say “I know a guy/gal…” and then ask them to join. Instead you should create a profile for what a great board looks like, which means a different profile for each seat, and then recruit based on that profile. The person you know might be right, but you should give yourself a few options for comparison. Gotta say this again: don’t fill independent seats with people who have no operating or startup experience. You already likely have someone like that (yourself, an investor), so don’t double-down on lack of operating experience. This article was originally written by Fred Wilson on March 12, 2012 here.